For example, Bonito is famous for it’s crystal clear waters. Some of the rivers have visibility of 40 metres underwater – and it’s incredible. There’s now a limit on the number of tourists that can go each day, and on the group size. Snorkelers are reminded not to touch the river bed it disturbs the natural environment. They are even asked not to use sunscreen or insect repellent, as it effects the delicate ecology. These steps to preserve the environment and still share it with tourists are paying off for Ygarape, and the tourist industry in Bonito. I joined the snorkelling tour of Rio Da Prata, with a group of about 12 people. The tour started with a short guided jungle walk (in our wetsuits!). After our jungle walk we arrived at a kind of lagoon. About 100m in diameter, the lagoon was filled with fish. It’s hard to take in. It’s a bit like being in a natural aquarium. Once in the water, it doesn’t take long to become accustomed to seeing large pacu fish, or the huge carnivorous dourado fish that ominously follow you around. There are dozens of species of small fish here too – some of them like to nibble on your dead skin. It’s not like the piranhas of the Pantanal, though. Something else I’d never seen, were the underground water sources, bubbling up on the river bed like a strange sandy soup. During the 3 hour tour, we floated down the river, with fish of all sizes clearly visible anything from right in front of us to 20 metres away. Certainly this snorkel tour was a highlight for me – if you want to share your close up fish experiences, make sure you take an underwater camera – I didn’t, so you’ll just have to imagine! Another way to get wet in Bonito is the boat ride down Rio Formoso – we were in a kind of white water raft, but Rio Formoso is actually pretty calm. There were a few little waterfalls to go over, and a nice swim at the end, but this is certainly a more of a family friendly adventure, than an Inspiring Adventure! If the boating sounds a little tame for you, then perhaps the scuba diving in the Rio Formoso would be more fun and challenging. 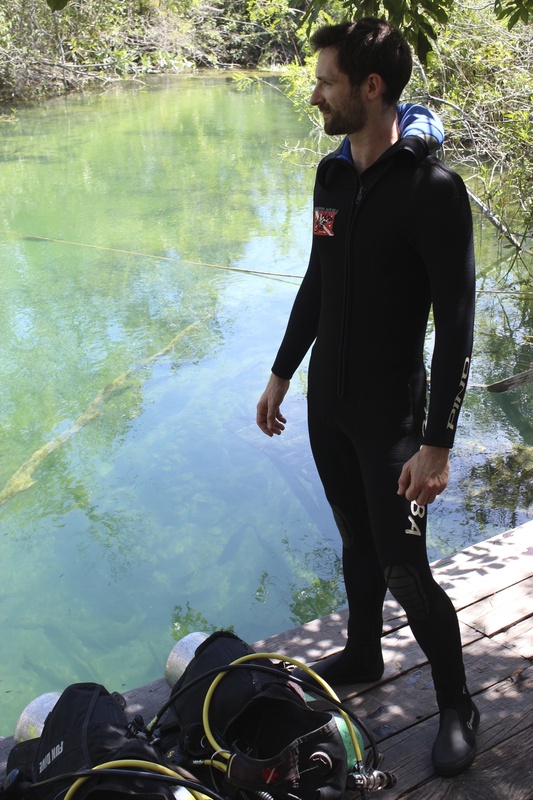 In the capable hands of Scuba Dive instructor, Benicio Silveira, newcomers and experienced pros are given the chance to dive in the river, and even pass under a small waterfall. I’ve been diving a few times in the sea, about 6 years ago, but this was my first time for a while, and first time ever in a river. For some reason, we seemed to have a couple of giant, tame dourado fish that came with us. They felt a bit like guard dogs, patrolling the water, but they were probably just looking for an easy snack. Not my fingers luckily. One of my highlights was popping up and surprising another group of tourists who were happily floating overhead on rubber rings – I felt a bit like I was in the special forces, but with out all the guns and war. It was nice, and Bennie enjoys his work, turning upside down for photos and pointing out the rare smaller fish along the route. 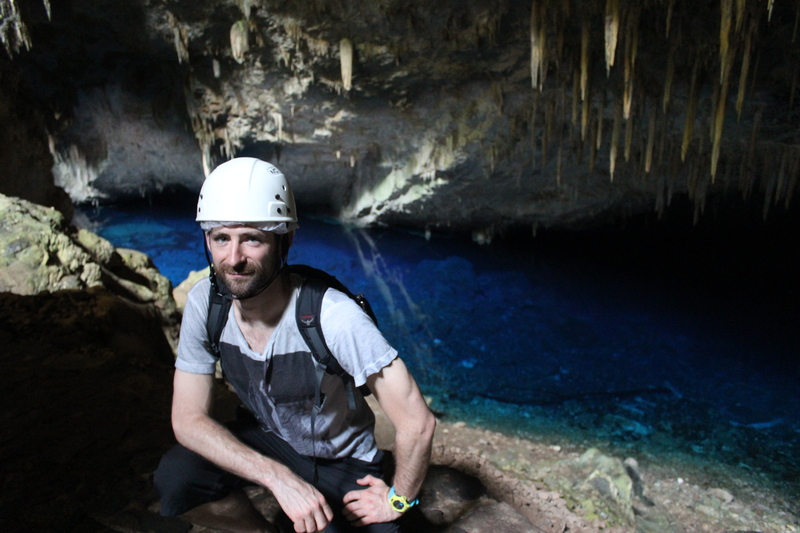 One last watery attraction to mention is the Gruta do Lago Azul, the mysterious luminous blue waters of an underground cave. Again, numbers of tourists are strictly limited and monitored. The beautiful cave houses an unusually clear blue lake. Apparently, tourists used to swim in here, but now the waters are protected from us dirty human swimmers. No wet suit needed! Unfortunately my tour guide only spoke Portuguese, so I can’t tell you much more about it! If you love aquatic destinations, Bonito is the place to be! This entry was posted in Adventure, Brazil, Central Region, Eco Tourism and tagged bonito, brazil, ecotourism, Juca, Pacu, pantanal, Rio Formoso, Scuba diving, Tourism. Bookmark the permalink.